Long before domoic acid ruined Northern California's 2015-16 Dungeness crab season, it was responsible for a panic along the Santa Cruz County seashore, which in turn informed a classic piece of creepy California cinema. Flashback to August 1961: In Germany, an enduring symbol of the Cold War -- the Berlin Wall -- is under construction. Barack Obama is born in Honolulu. No one but a handful of Japanese researchers has ever heard of domoic acid. And in beachside communities near Santa Cruz, birds are going nuts. A massive flight of sooty shearwaters, fresh from a feast of anchovies, collided with shoreside structures from Pleasure Point to Rio del Mar during the night. Residents, especially in the Pleasure Point and Capitola area, were awakened about 3 a.m. today by the rain of birds slamming against their homes. Dead and stunned seabirds littered the streets and roads in the foggy, early dawn. Startled by the invasion, residents rushed out on their lawns with flashlights, then rushed back inside, as the birds flew toward their light. Television aerial supports were severed, and one power line was shorted out about 4 a.m. on Merrill Avenue when the birds hitting the lines slapped them together. Russell opined that the sooty shearwaters, which fly tens of thousands of miles around the Pacific basin each year, became confused by a thick fog and flapped in a blind panic toward lights onshore. Others thought the sound of gunfire from the Army's Fort Ord might have spooked the birds. One of those who took note of the sooty shearwater episode was movie director Alfred Hitchcock, who owned a 200-acre estate at the end of a narrow, winding road in the Santa Cruz Mountains. Three days after the invasion, the Sentinel buried an item on page 4: Hitchcock had read the paper's account of the invasion and planned to use it in his adaptation of the Daphne Du Maurier short story "The Birds." Mitch: Mrs. Bundy, you said something about Santa Cruz. About seagulls getting lost in the fog, and heading in for the lights. Deke: We don't have any fog this time of year, Mitch. Mitch: We'll make our own fog. Sholes: How do you plan to do that? Mitch: We'll use smoke pots. Like the Army uses. Deke: What good'll that do? Smoke's as bad as birds. Mrs. Bundy: Birds are not bad! Sholes: How can we go on living here if we blanket the town with smoke? Mitch: Can we go on living here otherwise? 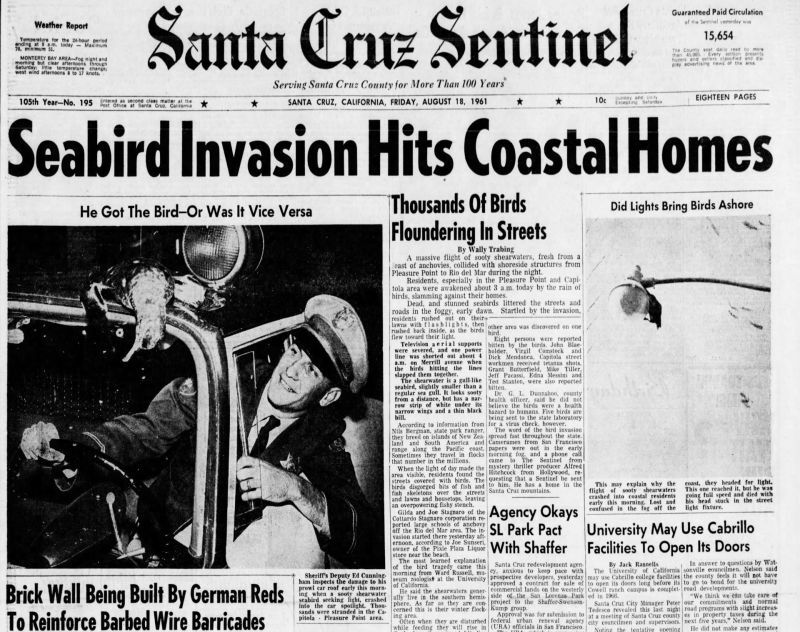 For decades, there was no better explanation for the the 1961 Santa Cruz bird mystery than they'd gotten lost in the fog. But in 1991, a clue appeared. Hundreds of brown pelicans and cormorants were found sick or dead along the Monterey Bay shoreline. Veterinary researchers eliminated viruses, bacteria or heavy-metal poisoning as the cause, then determined the birds had suffered acute poisoning by domoic acid. The toxin was found both in anchovies the birds had fed on and in plankton the fish had consumed. UC Santa Cruz marine biologist David Garrison studied the 1991 incident and speculated several years later that domoic acid might have been responsible for the 1961 bird invasion. It wasn't until 2012, more than half a century after the episode, that researchers from UC San Diego's Scripps Institution of Oceanography found direct evidence that the sooty shearwaters had indeed suffered domoic acid poisoning. The Scripps scientists used an archive of biological samples from California Cooperative Oceanic Fisheries Investigations, a marine monitoring program in operation since 1949, to try to investigate the conditions the birds would have encountered in Monterey Bay in the summer of 1961. Specifically, the team was looking for samples that might show the presence of Pseudo-nitzschia, a genus of diatoms that includes species known to produce domoic acid. Given the similarities between events in 1961 and the domoic acid-induced poisoning of 1991, we suggest that toxic Pseudo-nitzschia were probably responsible for the odd behaviour and death of Sooty shearwaters in August 1961. This brief study therefore supports the contention that domoic acid caused the seabird frenzy ... and strongly suggests that domoic-acid-producing phytoplankton have been an agent of marine animal mortality in the California Current system for at least the past fifty years. OK -- maybe not quite Perry Mason stuff. But case closed.